Keywords: Geopolymer, sodium silicate, refractory clays, design of experiments, response surface, brick kilns. In Mexico, fixed kilns made of red brick are often used today. However, after several burn cycles at temperatures of up to 1000 °C, these kilns may expand, crack and open. In light of that, we worked to obtain a refractory geopolymer that attaches to red brick to use as an internal kiln coating to increase the useful life of the kiln. We studied the consolidation from refractory clays and a solution of commercial sodium silicate ( =1.38, SiO2/Na2O ratio =3.09). This process originates the synthesis of a geopolymer. The clays were previously selected for their refractory characteristics from different clay banks in the municipality of Comonfort, Guanajuato, México; they have been identified as Caolín, Tepozán, and Bauwer. The clays were subjected to a process of grinding and sieving to a particle size of 60 Tyler mesh . 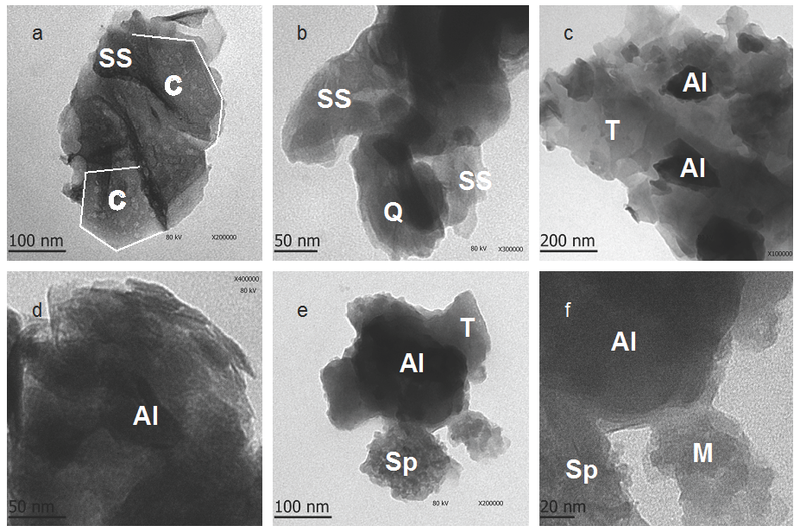 Next, they were characterized using energy dispersive X-ray spectroscopy (EDS), which determined that they contained high percentages of SiO2 and Al2O3. The mineralogy of the raw clays was analyzed by powder X-ray diffraction (XRD), yielding high percentages of kaolinite, alunite, quartz and smectite. This composition validates the refractory potential of clays. A simplex-centroid design was used to formulate the geopolymer. The response surface methodology was used for optimization, keeping the commercial sodium silicate concentration constant. The adherence of the formulated geopolymer on red clay brick was taken as a response variable, yielding 50% for the consolidating material (commercial sodium silicate), 21% for Caolín, 23% for Tepozán, and 6% for Bauwer, where the curing time was 7 days and the burning cycle was 8 hours at 1000 °C. This property was measured in a universal testing machine. The best fit was a quadratic model with synergistic interactions between all factors, and the mean adherence of 28.11 kgf/cm2 (2.8 MPa) was obtained. Common potential applications of geopolymer coatings include protection against salt corrosion of marine concrete, reinforced concrete manufacturing, concrete infrastructure rehabilitation, fire inhibition, resistance to temperature and corrosion and as heat insulators. Geopolymers may also have promising use in construction due to their similar strength and durability properties as conventional concrete. The red brick joined to the obtained geopolymer can be used as an internal coating in fixed brick kilns to increase its useful life. In addition, it has potential use for bonding materials that may be exposed to temperatures below 1000 °C or for replacing concrete in ovens exposed to high temperatures.